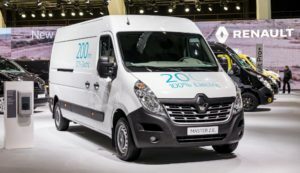 Following its best ever year for UK van sales, French manufacturer Renault has pulled the wraps off one brand new electric van and an updated version of another. Unveiled at last week’s Brussels Motor Show in Belgium, the Master ZE is the largest vehicle in Renault’s EV line-up and has a quoted range of 124 miles on its all-new battery pack, which will become a key part of the powertrain for all Renault electric vehicles from now on. “This electric version of Master is aimed primarily at fleets running last-mile distribution services in the city, as well as large municipalities and local government. 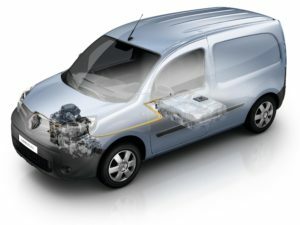 This heavy van’s load characteristics, range and charge time are tailored to the needs of business customers in and around urban areas,” said Ashwani Gupta, Renault’s Vice President and Global Head of Light Commercial Vehicles. With traditional large van bodywork, the Master ZE will be available in three lengths and two heights. It has a power output of 57Kw (equivalent to 76bhp) and can be fully charged from a 7Kw charger in around six hours. Sales will commence across Europe in late 2017. Meanwhile, the company also used the Brussels event to unveil a new version of the Kangoo ZE, which is currently Europe’s best-selling electric van. Using the same battery pack as the Master ZE, the Kangoo ZE has a quoted range of 168 miles, thanks to its lighter weight – an increase in range of around 50% compared to the existing model. The Kangoo ZE also features a heat pump, which helps maintain battery condition and performance in cold weather, a factor that is known to adversely affect range. The new Kangoo ZE goes on sale across Europe ahead of the Master ZE, with customer deliveries expected by mid-year.